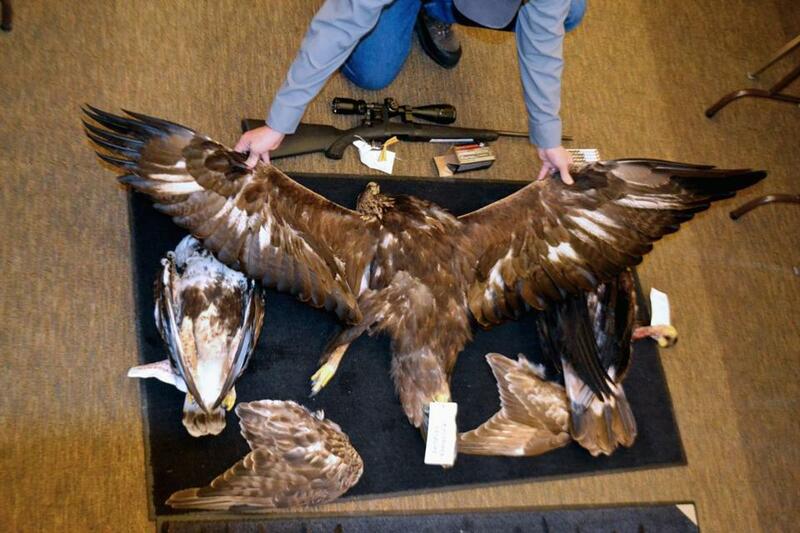 A Nevada game warden displayed the carcasses and wings of two golden eagles and a hawk seized from an Arizona man in 2016. Eagles are the national symbol of the United States and they’re widely considered sacred by American Indians. Federal law limits possession of eagle feathers and other parts to enrolled members of federally recognized tribes who use them in religious practices. Bald eagles once nearly disappeared from most of the United States but flourished under federal protections and came off the endangered list in 2007. Hunting them generally remains illegal. Dan Rolince, the US Fish and Wildlife Service’s assistant special agent in charge of law enforcement for the region, said he expects the new cases to be among the largest his agency has handled as more charges are added. The cases involve as many as 250 eagles — most of them shot — but include more than 40 species of protected birds. Rolince said buyers generally make purchases through online contacts or word of mouth, and that it’s difficult to determine the size of the market. ‘‘It’s prevalent enough that we were able to make a case of this size in a relatively short period of time,’’ he said. The defendants include people from Iowa, Nebraska, South Dakota, and Wyoming. One case accuses a Rapid City family, Troy Fairbanks and his two adult sons, who are enrolled members of the Standing Rock and Lower Brule Sioux tribes. The father ran a Native American dance troupe called Buffalo Dreamers that performed at venues such as the Crazy Horse Memorial and Custer State Park in the Black Hills. But they also did a large trade in eagle parts and feathers, according to their indictment. Fairbanks bragged to an unnamed ‘‘cooperating individual’’ that he was the ‘‘best feather man in the Midwest,’’ boasting that 19 people in the Los Angeles area wanted to buy from him, his indictment says. Fairbanks also claimed in May 2015 he could acquire 60 eagles by winter of that year. By that point, with over a year of deals worth thousands of dollars under their belts, the ‘‘cooperating individual’’ had gained the trust of Fairbanks, who believed that person wasn’t a law enforcement officer ‘‘because you would have popped me by now,’’ his indictment says. A man who answered a telephone number for Buffalo Dreamers hung up when a reporter identified himself and didn’t respond to a subsequent text message. Federal court records don’t list an attorney for the 54-year-old Fairbanks, who hasn’t returned e-mails sent to an address listed in the indictment requesting comment since Monday. Another group included Juan Mesteth, an enrolled member of the Oglala Sioux. An unnamed ‘‘confidential informant’’ made contact with Mesteth in the Pine Ridge area of South Dakota. After Mesteth and the informant conducted a couple of deals, Mesteth introduced the informant to his connections in Wyoming who could supply whole carcasses and took them eagle hunting, according to the indictment. Authorities haven’t disclosed how much the defendants are thought to have profited. There are legitimate ways to obtain eagle parts for religious purposes. The US Fish and Wildlife Service operates the National Eagle Repository to provide Native Americans with eagle carcasses, parts, and feathers. Indians can also inherit them within their families or receive them as gifts. Seiler accused the defendants of a lack of reverence for the birds.